In the production of building materials and ceramics, such as engineered lumber, roofing materials, structural blocks, and decorative ceramics, the control of moisture sorption is important. Whether it is in preparing a surface coating or optimizing a cement formulation, feedback on the effectiveness of the process is critical. Measuring the water sorption of these materials under actual or aggressive (accelerated) conditions can provide the information needed to perfect the process. Since the absorption of water can compromise the structural integrity, alter the dimensions, or promote the growth of mold, being able to minimize the amount of water adsorbed or absorbed by the material is important to the engineering of these building materials. Both gravimetric (Aquadyne DVS) and volumetric (VSTAR) provide means of measuring the amount of water absorbed by the materials and provide valuable information on the effectiveness of a waterproof coating or a water resistant formulation. 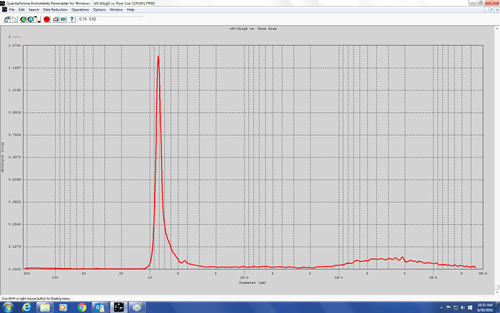 Quantachrome Instruments for water sorption analysis are the Aquadyne DVS and VSTAR. Water Activity (Aw) is defined as the ratio of the partial vapor pressure of water in a substance to the vapor pressure of pure water at the same temperature (i.e. P/P0). Water activity is a good indication of the amount of moisture in a material and can be a valuable indication of the initial condition of raw materials used in producing building materials. Knowing precisely how much water is in the material can provide a means of screening the raw material before accepting a delivery and can also be useful in adjusting the formulation or process to ensure a quality product. The Aw of materials can be measured by placing the material in a closed container, allowing it to come to equilibrium, and measuring the relative humidity in the chamber. In this case Aw = RH/100. The Aquadyne DVS has the capability to measure the relative humidity in a thermostatically controlled chamber. 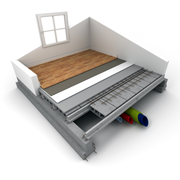 Although the chamber is not hermetically sealed, since it is designed as a dynamic system, it is sufficient to establish equilibrium and determine the water activity. Quantachrome Instruments for water sorption analysis are Aquadyne DVS . A novel method of determining the age of archaeological fired clay and ceramic artifacts has been developed at the University of Manchester, England. During the manufacturing of ceramics the green pottery is fired at temperatures in excess of 500°C. At these temperatures all water, including chemically bound water, is driven off. When the ceramic cools, it immediately begins absorbing water. Initially the water absorbed is physisorbed onto the surface and into the pores of the ceramic, but after the pores and the surface are saturated, the water begins to chemically bond to the material (hydroxylation). It has been shown that the rate of this hydroxylation process is proportional to the fourth root of the time since firing (t¼). By measuring the amount of water lost when heating the ceramic and the rate at which it is rehydroxilated, it is possible to extrapolate back to t=0 and determine the age of the artifact. The Aquadyne DVS is perfectly suited to these measurements. Quantachrome Instrument for determining the age of ceramic and fired clay materials is the Aquadyne DVS. Wilson, M.A., Carter, M.A., Hall, C., Hoff, W.D., Incd, C., Savage, S.D., McKay, B., and Betts, I.M. 2009. “Dating Fired Clay Ceramics Unsing Long-term Power Law Rehydroxylation Kinetics.” Proceedings of the Royal Society A, 465, 2407-2415. Wilson, M.A., Hamilton, A., Ince, C., Carter, M.A., and Hall, C. 2012. “Rehydroxylation (RHX) Dating of Archaeological Pottery.” Proceedings of the Royal Society A, 468, 3476-3493. http://dx.doi.org/10.1098/rspa.2012.0109. #57 - Using the Aquadyne DVS to Date Archaeological Material. For bioceramics, especially implantable devices, porosity is a critical material characteristic. Many times bioceramics are being used to mimic the human bone which is a highly porous, but yet incredibly strong material. The desired physical characteristics such as cell adhesion, bone ingrowth, and vascularization will be heavily influenced by the porosity of the materials. Much research has been conducted not only looking at total porosity but looking at the ideal pore structure for promotion of cell, tissue, and muscle growth and adhesion. Mercury porosimetry is an ideal technology for the measurement of 3 dimensional materials and is sensitive to the arrangement of pores. Nanomaterials are ultrafine particles, less than 100 nanometers in size. They can be engineered at the atomic, molecular, or macromolecular level to provide novel material properties and functions. In short industrial researchers are precisely engineering novel new materials to meet specific performance application needs. Some properties that can be tailored to specific applications are electrical conductivity, magnetic properties, transparency, ultraviolet protection, thermal properties, optical properties, hardness and other structural properties. Many of these performance characteristics are directly related to a material’s surface area. Large surface areas can yield magnets with specific performance characteristics including submarines, automobile alternators, land based generators, motors for ships, and MRI. Changes in surface area can also impact physical performance properties of optical properties, or electrical conductivity. As researchers tailor and tune these new materials the accurate analysis of surface area is a critical characteristic that impacts material performance. Quantachrome Instruments for density are the Automated Pycnometer , Mercury Porosimeters, and Surface Area Analyzers. Article 07152 - "Bioceramics: Synthetic Options to Autografts and Allografts" (Porosimetry) from outer space to inner space, ceramics are perhaps the most fascinating group of materials. And they are used to repair broken bodies. High Quality on a Nanoscale By Christine Grahl as published in ceramic industry. 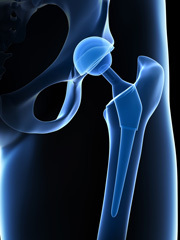 Tech Note #38 - Pycnometers Aid Osteoporosis Research. Cement, concrete, mortars and other cementitious materials are used for structural construction, cosmetic finishes, and even forms of artwork. The material properties of these different applications vary, but the methods for measurement are common to all of these materials and their precursors. Density, surface area, pore volume, porosity, pore size, water content, and affinity to water (hydrophilicity) of the raw materials, the additives, and the end products are some of the critical properties that affect the structural and textural characteristics of cements and mortars. Water vapor isotherms provide a wealth of information about the properties of the raw cement and additives as well as the finished product. The water content of the raw ingredients can affect flow and pouring characteristics. Water activity measurements can indicate the amount of loosely and tightly bound water in the cements. Water sorption isotherms can be used in conjunction with nitrogen or argon isotherms to quantify the hydrophilicity1 of the powders. The Aquadyne™DVS and the VStar™ provide complimentary information on the interaction of water with these materials. 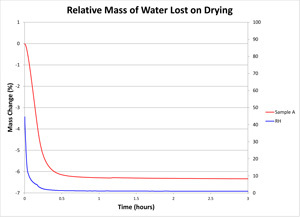 The gravimetric method used in the Aquadyne™DVS is ideally suited to measuring water content (see Fiqure1 below, Relative Mass of Water lost on Drying). 1 Matthias Thommes, Sharon Mitchell, and Javier Pérez-Ramírez. “Surface and pore structure assessment of hierarchical MFI zeolites by advanced water and argon sorption studies. ” The Journal of Physical Chemistry C 116.35 (2012): 18816-18823. The amount of bound water vs. free water can be determined by acquiring two isotherms in a row without degassing in between. The first isotherm deposits both bound water and free water, but only the free water comes off in the desorption step (see Figure 2. above right). Water sorption measurements of hardened cement products give vital information about the strength, porosity, and physical stability of the product. For example, Powers and Brownyard2 have used water sorption measurements to evaluate several characteristics in hardened Portland cement. 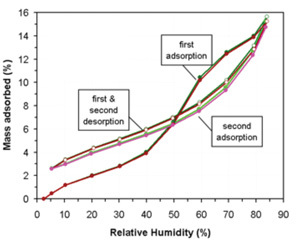 Characteristics ranging from permeability to thermodynamics of adsorption provide useful information on the performance and curing times of cement and can be valuable tools in optimizing their formulations. 2 Powers, T.C., Brownyard, T.L., Studies of the Physical Properties of Hardened Portland Cement Paste, Journal Proceedings, Vol. 43-9, (1946) 249-336. The true density value of cement materials is routinely needed for determination of their fineness, as with the Standard Blaine method ASTM-C204). Gas pycnometry presents a viable alternative to older, established methods (such as ASTM-C118) which employ difficult to handle liquids, like kerosene or naphtha. Using an inert dry gas, typically helium or nitrogen, as the displacement fluid eliminates any of the safety related challenges related to using liquids like those mentioned above. This completely non-destructive, operator friendly technique also allows for multiple measurements to be easily performed, increasing the confidence in the results. The UltraPyc™, and PentaPyc™, utilize gas displacement to measure the true density of a material, which excludes the influence of any pores accessible from the exterior of the sample. Pore size distribution is an important factor that affects the moisture diffusion and permeability properties of cement-based materials. Mercury intrusion pore size analyzers are routinely used to assess the pore volume associated with pores sized between 0.003 and 950 µm Mercury intrusion is a simple and quick technique capable of accessing an extremely wide size range of pores difficult to access with other analytical techniques. Because of this, it has long been used to provide pore size and volume information for cement-based materials. Our PoreMaster™ series of mercury intrusion porosimeters the pore size distribution and pore volume associated with all pores accessible from the exterior of a sample. This is accomplished by measuring the volume of a completely non-wetting liquid, mercury, which is intruded into pores at increasing pressures. The relationship between the size of a pore and the pressure at which mercury is gradually intruded is defined by the Washburn equation. A typical example of a pore size distribution measured by mercury intrusion.